Greetings guys, just writing this guide out of boredom hope you guys enjoy it. I suggest you guys try the arena out and gain some Battle experience first before you start reading this guides. Main Tank – Lure it and build up Threat. Dodge all the aoes and drag the boss out of the aoe for melee DPS to maximize their burst damage. Melee DPS – Be catious about your HPs, if Front doesn’t have LOR, make sure you keep yourself Survive all the time. Priest – Keep up with Heal/ Aspersio / Ulti heal/ Bubble on Main Tank, 2nd priest are assigned to Heal Sub tank or Off Tank. Range DPS – Start your burst Damage After 10 seconds (for Main Tank to Build up Threat). Wizard are require to help AOE adds when Off Tank lures it. ^ every single Classes need to learn how to react upon AOEs, Adds. ^ On AOE like Gearbog, Driller, Pertus, Deluge it. Or W.E you like, suggest a dps ^ as in vador/Giant Driller as a minimum requirement. -Whirlwind AOE – Similiar aoe to Xeno Spider, Giant Driller. -Headbutt Attack : Aoe that hits everyone, 2~3k damage. -Single Wave : A Single Wave that hit whoever stand behind the main tank. -Enrage level 1 : gotta check later. -Summon Vador I: Boss HPs 70% and HPs 30%. 35k hp Adds, 400 per hit. -Enrage III: After 10mins, you are dead Meat. -Ice Ring : Boss Below 80% hp will cast, Dot, 1k above, depends on defense, It Freeze people whoever stand on it too long. -Summon Vador II : hp 40% will summon, 80k HP. – Enrage III: After 10mins, you are dead Meat. (P.S, you can do Red 1st only change to Blue) Reason why prefer Blue over Red is, it will add pressure to overall play game when Ice Ring are cast, more pressure. Down Vador Blue to 70k~40k, then switch target to the Vador Red one. or Else, after 10 minutes, prepare to get wiped. This Boss require to maximize damage on the boss. 4th Boss -Xeno Spider- Hammer Hammer hammer..
-Summon Bomber – Adds, deal 1k above on close range. -Twins Hammer Aoe – Below 15% hp, will do Hammer Aoe twices. 4k x2, Only cast once. DPS Sorc help Dps, Deluge when overall Range Group hp fall below 80%, or after hammer Aoe is casted. Deluge Beforehand when boss reaching 10% hp, Twins Hammer aoe coming. – Mid-Range Circle Ring – Deal 2k above damage in Middle Range. – Enrage III: Similiar to Vador Y,Vador X. It will Rage if your dps are too slow. Sorc DPS help LOV, Deluge when Driller EX is casted. FS Sorc Help LOR/ Deluge when Driller Ex is casted. – Lazer BEAM! – Randomly target, Single, and deal 2k ~3k depends on your defend. Sorc DPS help LOV, Deluge when Freeze Screen Attack is casted. FS Sorc Help LOR/ Deluge when Freeze Screen Attack is casted. Blue Tornado – DOT 1.5k~2k, Deadly, walk out of it. 40% will summon red bull, tank it but focus on the Blue Bull until it down, after this kill it. Red Whirlwind – DOT 1k~2k, the different of this and Blue Tornado is, this much smaller but it chase after people. Blue Bull > Red whirlwind > walk in 1 direction and never walk back to it. 40% will summon Blue bull, tank it but focus on the Blue Bull until it down, after this kill it. Red Wave – 4k~6k attack, deadly with humbaba adds buff, main tank are suggest to stay out of it. Enrage III – buff himself with abnormal attack/defend/skill cooldown. 7~10minutes. Healer follow up the Main Tank, Sub healer can heal off tank that tanking the 3 adds. Dps focus on Humbaba Pleasure, once Pleasure is down, Let the off tank lure to right corner, or more than 20m from the boss to avoid buff. Dps on Boss humbaba and kill Deviruchi Adds when it spawned (suggest 1 tank that eat red pot and kill it in aoe), ignore Humbaba Fury and humbaba Patients and let the off tank to tank it. Lord of Vermillion (blue aoe) – cast when the hp are below 50%, 4k above damage, Target a single target with a blue lightning circle on it, whoever caught into it will get hit as well. Summon Vegence Hollow (forget the nick) – After Baphomet JR, around 60% hp. 1k~2k, move in very slow pace. Baphomet > Summon Baphomet JR > Clear it ASAP, Off tank /Wizard aoe it (red potion to lure it, Suggest Off tank to do it) healer got to heal off tank, quite painful when it hits together, around 2k plus. For some raid party might prefer luring out the bosses and reset the adds, or luring adds and reset the boss, is up to you guys which path to decide. Enrage II – Boost himself with attack and defense, after 7~10 minutes Engage. Blue Bull > Enrage II > (DPS got problem) once you get to know how to dodge, make sure your second run full dps ASAP, if not.. you get what i mean..
Red Bull > Aoe Slow Attack > Suggest you guys to stay far from Boss like 5m, and seperate stay alert from Bomber/Bear/Red Whirlwind! Red Bull > Enrage II > 7~10minutes (DPS got problem) once you get to know how to dodge, make sure your second run full dps ASAP, if not.. you get what i mean..
Just make sure the Red Bull going to Cast everytime he do special moves (Red Wave are much faster than Blue Wave, make sure you get out of it, but sometimes it hit in random target) *i could not explain why it hits randomly ._. Just dodge and dodge when you need to dodge. Humbaba > Self Lightning Aoe > Time this skill every 30 sec, or tank it if everyone have 5k above hp. Humbaba > Enrage III > lack of dps, time to change a team i guess? make sure you Humbaba Fury stay out of the range to avoid Boss Humbaba get buffed. Main tank Lure the Boss Humbaba to the left corner, make it doesn’t faces your range group. 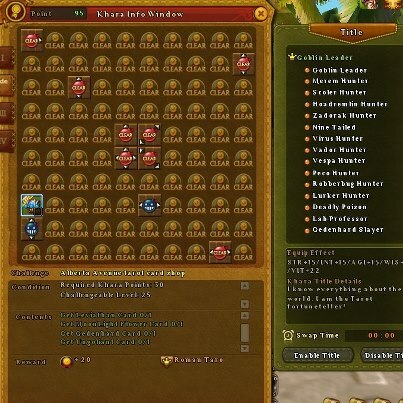 This is a compilation of the skills required for class specific khara quests. These appear as a lock until you utilise the skill required once. All require 30 casts, unless otherwise stated. Skill name. Title. Title stats. Moonlight Flower can be found on the 4th floor of Payon Dungeon for characters of lvl’s 28-34. And the few bosses at mid-lvl with an actual mechanic that must be obeyed if not the entire party will i repeat WILL face a wipe. Now it is greatly advised that you get a priest with the emergency aoe heal and dmg protection that is “SANCTUARY” just in case and that MAXIMUM only 3 members of your party are melee, anything more and the healer cannot cope. There are few essentials that you must get down if you are to attempt this boss. 1.) The boss will cast an aoe stun occasionally that ranges in duration from 1-2 seconds and drops 2 tombstones next to her. DPS down these 2 tombstones, they will spawn 2 NPC’s on your side whom will grant an aura buff reducing 30% dmg of the stun that Moonlight Flower will cast occasionally. Please note the aura buff radius is incredibly small meaning you have to literally stack on top of the NPC’s spawned. 2.) She will spawn 3 Foxes (1.5-2.5k hp, cant really remember) as is the usual RO2 boss mechanic at random intervals. Recommend that you dps down these quickly as they usually go for the healers immediately. 3.) She will also cast an occasional black circle around her with a rather large radius, the only WARNING that you will get prior to this is a WHISTLE. When you hear that whistle, the black circle will spawn 1-2 seconds later on the position in which she whistled from so when you hear the whistle you can pull her away first and the circle will spawn at that original position that you pulled her away from 1-2 seconds later, so pull her away from the position where she whistled and get out of there ASAP.It is VERY IMPORTANT that you pull her OUT of the circle and that NO party members are inside of the circle. FAILING to do so will result in either an instant wipe or 1-1.5k dmg. 4.) (*Unconfirmed) She will also occasionally cast a black swirling tornado around her body immediately. This damage is UNAVOIDABLE and can range from 200hp to 50% of your hp or none at all (Which is weird, and I hope someone can clarify this). So bring pots along. 5.) Once her HP reaches 45,000 she will summon 2 illusions of herself with hp ranging from 3.5-4.5k. Immediately shift all dps to them and get rid of these as a few seconds later she WILL summon 3 foxes and your healer will not be able to cope nor will your tank be able to pull them all. Be warned certain parties at this stage might find all of themselves with HP’s around 200-500HP. It is at this point that the priest’s Sanctuary AOE heal and dmg protection comes in handy as it is a LIFESAVER. Like I said only a few parties will face such a crisis, not all. Once you pass the illusion stage, it is pretty much the same thing. Just listen out for the whistle, stay near the 2 NPC’s to get dmg reduction from her stuns and pull her out of the black circle and deal with the mobs accordingly. Credits to kanapwn and BerryX on Jormungand server for explaining most of the mechanics to me on my first time and getting it down on our 3rd attempt with 3 new guys on the party. 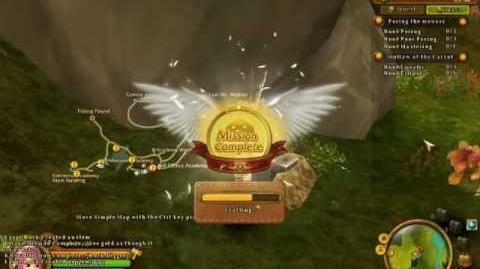 Recommend questing until you do not have two quests in the award – winning Dungeon pattern sword and pattern torso. inside is still one more questpattern pants. all blue on Level 37. I guess I must say that inst extremely simple. much easier than the basement in the Forest. the first room on the perimeter of a large lot of trash goblins does not necessarily kill. The first boss. GET OUT from purple circle on the ground. MAX heal and the best running back of strong AoE. screams in red chat. straight corridor. if you do not need to Khara quest mobs then just ahead. we were all strangers for each other, first timers, same level around 38 or 39, knew nothing about this dungeon, yet we cleared this dungeon quick and easily. because we were a full dps team, we killed 4 summoners easily and none of us knew what would happen if we killed those summoners late. and that time, i knew what hell would happen if we killed those summoners late… our party lacked of dps, we killed those summoners late and we ended up spending almost an hour trying to beat the final boss & his summoners. well, last try i was lucky enough to have 3 consecutive critical fire bolts to kill one summoner, helped assassin to kill another, and lastly used fire explosion to kill the last remaining summoner that our knight and priest tried to beat desperately (our warrior was doing his part well). my advice is : get a full dps party to clear this dungeon easily. 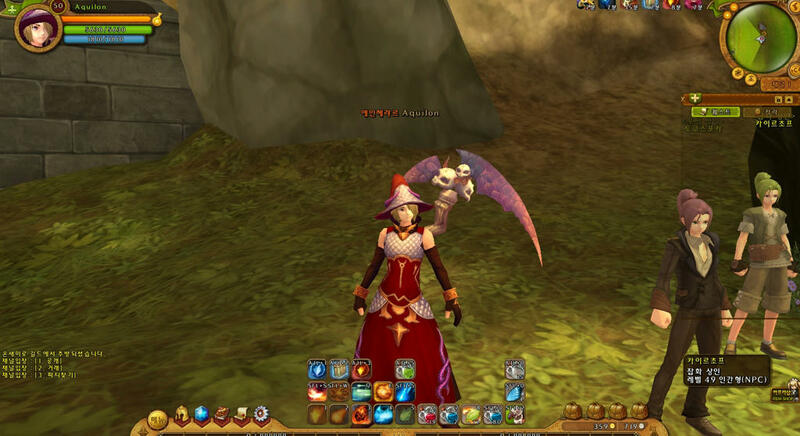 I play as Aquilon on the Korean server, and the armor you see is lv 50 raid (epic) equipment for the wizard. I think it helps my credibility. The wizard is a very BORING class. Movement is almost non existent, and most of the battles are fought with two keys: hot keys of fire bolt and fireball. The only area where it shines is it’s flashiness. It’s damage is lower than rogues, rangers, sorcerers,attack priests, but equals with the assassin. (In other words, lowest or 2nd lowest of dealers.) People know you exist because you jump around the map with teleport and survive random moments with ice wall. Most people (including me) play this character just because nobody plays it allowing free access to parties. You might ask, “If it’s such a bad character, why do parties take wizards?” Well my friend, sorcerers and priests want the 10% int buff… and that’s about all they ask you to do. For those that might have questions about why I didn’t level skills that you might think are useful, here’s a quick tip on why not. Cold Bolt – This skill is used with lightning bolt and frost diver in the early levels, but it is outclassed by the fire bolt due to stacking of Fire Arms and Dragonology, even without the help of pyromaniac. Frost Diver – This is also a skill used mainly in the beginning. However, being unable to freeze bosses, it is usually thrown away. Water Arms – Due to DOT damage, water arms is not used. Additionally, 10% damage reduction is unnoticeable for wizards. Frost Nova – Truthfully, this is a very useful skill, however it preforms very well even at level 1. Ice Wall – 3 minutes is a long time to wait, especially in battle. However, 3 minutes is enough to use twice on a single boss. Anything other than 3 minutes is too long, and you might as well invest 1 in Ice Wall at that point. However, having no true survival skills other than this, it is necessary for you to invest 5 points in this skill. Lightning Bolt – It is also like the cold bolt. It is very soon outclassed. Firebolt to Dragonology should be self explanatory. Fire Explosion – This is (used to be) a VERY debated skill for all people. This does around 3000-3500 damage without critical hits and is seen as the wizards ultimate attack. However, even if pyromaniac was leveled up to 5 and Fire Explosion was too and Fire Explosion was used just before the 30 seconds were over every time, during the time Fire Explosion is being used, 2 fire bolts can be fired. Now the problem with Fire Explosion lies here. Each fire bolt at level 50 does around 1200 – 1500 damage with the right equipment. A single critical hit will do 2400-3000. Although the Fire Explosion does 3000-3500 damage, it is spread into multiple shots doing 600-700 damage. Unless all 5 hits of Fire Explosion ended up as critical hits (which VERY rarely happens) it does not outshine the fire bolt. As a matter of fact, even if one of the two fire bolts were to be a critical hit, it would outshine the fire explosion. Additionally while this is happening, pyromaniac would be filling up which is why many people invest points in other skills. Warriors are trained in the use of various weapons and tactics while taking advantage of their superior charismatic force. The Warrior is a Nomad of Honor, they are not authorized by the Kingdom of Prontera. Warriors are free to harm humans, they believe that due to it’s nature military combat will always affect the public. They are only allowed to participate in military action battles as “mercenaries”. Nevertheless, for those who with to fight the path to become a Warrior is a popular one. Warriors have proven to be more efficient than any other combat class and have the most polished expertise on the battlefield. The only stat you need to focus is having 40 str at the end of the day. This is because that’s the source of your phy. attack! Besides that, what’s matter the most is your equipment’s bonus stats as they have a big role in boosting your status. just leave it at lv 1. Not as effective as your red potions! XD. leave it at 0/5 if you’re going to become pure DPS. no need to ask. it’s your MUST have skill lol. I recommend to max this but you can choose not to. increase your attack by 4 * Lv. leave it at 1/5 if you’re going to become OT, or max this if you’re planning to be Pure DPS. Your only self heal. max this. would definitely save some of your red pots. another your everyday skill. Max this. great skill for tank. Leave it if you’re not Tank. Another skill for tank. Leave it if you’re not Tank. a MUST have skill for Off Tank warrior, otherwise leave it. There you go folks! I will update this from time to time. see you guys again! 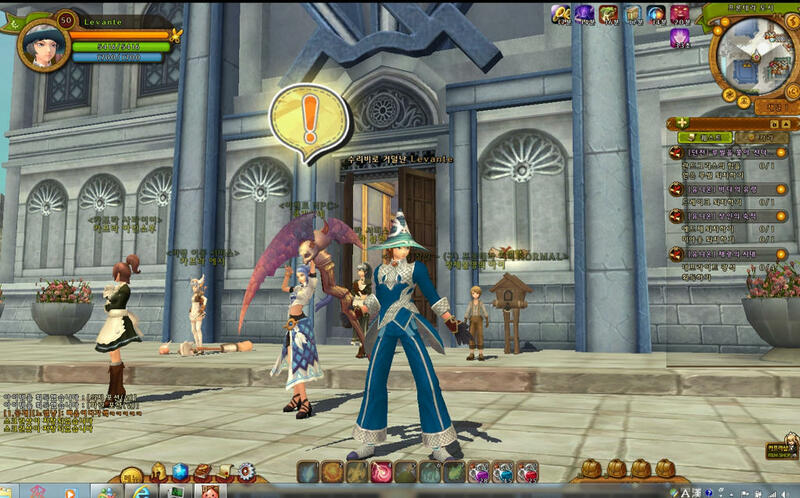 Acolyte is one of the first five main classes in Ragnarok II: LOTS. Like many other MMORPG, Acolytes are experts in supporting and healing abilities which play a very important role in a party. Because of those abilities, they can grind just fine whether it is solo or party. There is no need for an Acolyte to buy any healing potions because they can spam heal. Their holy spells are not to be underestimated. They got great offensive spells, although aren’t as great as Magician’s spells. But they are capable on boosting skills up to the fullest (Asperio). Although with those advantages, Acolytes are short on Health Points (HP) and lack of defense. I have listed all Acolyte’s skills, its description, my commentary and personal ratings for each skill. Description: Recover one’s HP equivalent to 30%/33%/36%/40%/43% of your magic power. Under the Asperio, the next three heals will become a critical hit. Commentary: This deserves a 5/5 rating from me. Yes, this skill is very great because you can spam it all day long. As an Acolyte, you’ll use this instead of Potions to save your money. Max this skill ASAP. Description: Conjure a divine cross to deal 27%/30%/33%/36%/39% of your magical damage to a single enemy. Next 3 Holy Light will become a critical hit under the buff of Asperio. Commentary: This is one great offensive spell you can have as an Acolyte because simply it has no cooldown with only 1s casting time and great damage. I suggest you to max this skill ASAP for the sole purpose of grinding. Description: Cast a gospel upon you and your partymates to increase Max HP by 3%/6%/9%/12%/15% for a duration of 30 minutes. Commentary: A no-brainer skill to max. It adds 15% of your Max HP with 30 minutes duration, no reason to dump it.Tankers will thank you for this. A must max skill. Description: Summons the Thunder of Judgement to inflict magical damage equivalent to 14%/17%/19% of your magic power on the top of the enemies within the Area of Effect. Commentary: This skill would’ve been more useful if it has at least 1s cooldown. The skill’s main purpose is just to stun your enemies. The damage and cast time are bad. You DO NOT want to use this skill at all. It is recommended for you not to learn this skill at all. Description: Summons a holy hammer to be thrown to the enemy and deal 22% of your magic power at level 1 / 26% of your magic power and will crit if the target’s HP is below 20% at level 2 / 30% of your magic power and will crit if the target’s HP is below 20% and gain 3 Holy Water if your enemy dies from this skill at level 3. Commentary: There are a lot of arguments flying around inside this skill. Some say this skill has to be maxed for faster grinding but some agreed not to max this skill or even take it. But those argument is invalid as your skills will be resetted once you transcend intoMonk. You WILL need to learn this skill to grind faster. It maybe not recommended for fellow Priests, but not for us. You can either max this skill or leave it at level 2. Oh yeah, only use this skill when your target’s HP is below 20%, otherwise you better off leave this skill entirely. Description: Increase movement speed of you and your party members by 40% for 10s/11s/12s/13s/14s. Commentary: Similar to RO1’s Increase Agility this skill increases your Movement Speed but the differences are there’s no increase in Agility in the RO2’s version and they add cooldown to it, the long one in RO2. The skill increases you and your party member’s movement speed by a nifty percentage of 40% but has a ridiculous cooldown. You either leave this skill or learn it but leave it at level 1. Do not attempt to max this skill at all. Commentary: Only learn this if you do party leveling all the time. Otherwise, do not learn this skill at all if you plan to solo most of the time. Even you can choose to use Renovatio on each party members rather than using this skill if you prefer party leveling. Description: Recover target’s HP by 16%/19%/22% of your magic power every 2 seconds for 12s duration. Commentary: While Heal needs you to cast for 1s and is not effective in combat, this skill does the exact opposite. This skill has no casting time and no cooldown and is efffective while it is active. That means, you don’t have to worry about your HP because it’ll replenish by itself while this skill is active. Description: Increases effect of healing skills when applied as critical hit by 340%/380%/420%/460%/500% exceeding 95% Hit Rate. Commentary: The description explains that Meditatio will increase the effect of healing skills but I am still in a hot water figuring this one out. So I can’t comment about this really as I never really bothered to look into this skill. Description: Recover SP by 15% and creates 3 Holy Waters. Commentary: You’ll be getting this skill whether you like it or not. It is a prerequisite for Asperio and it is great having 3 Holy Waters which is useful for Asperio. Description: Ressurects a dead player in your party. You can revive a fallen player to max HP and without cast time under Asperio buff. Commentary: Another skill that is full of debates. After the patch that increases this skill’s cooldown drastically, people chose to leave this skill at level 1, but some players chose to max this skill because of the drastic cooldown decrease per level. But you do not need this skill because you’ll transcend into Monk later on. Just put this at level 1 as the prerequisite for Aqua Benedicta. Description: Requires 1 Holy Water. Improve Acolyte’s skill effects. The affected skills are: Holy Light, Heal, Ressurection, Judex, Highness Heal, Sanctuary (Priest), Magnus Exorcismus (Priest), and Ray of Genesis (Priest). Commentary: You’ll be needing this skill to increase the effects of your skills, especially Heal and Holy Light. You can choose to not learn this at all or max this if you have spare for faster killing with Holy Light and crit-heals with Heal for leveling. Description: Chants a spell which recite the prayers of gods to inflich 8%/9%/10%/11%/12% of your magic power on every 2s for the duration of 20s. Commentary: Bad skill is bad, you better off spamming your Holy Light rather than using this skill. The damage is horrible even for a DoT. But Priests find this skill very useful because it can be stacked with other DoT skills. First of all, as you will transcend into Monk later, you do not have to worry about picking the correct skill or whatnot. Just pick and max any offensive skills that you have (except Oratio) to fasten your leveling process. Holy Light and Lex Divina are must max skills. Heal and Renovatio are also a must for healing purposes. Take Asperio if you want a slight faster killing using Holy Light (it crits under the Asperio buff). Those are pretty much the core skills that you must have. You can add Highness Heal if you want to (Meditatio must be learned as prereq). You can choose to drop Blessing and max Renovatio. It’s your call. As an Acolyte striving on becoming a Monk, just focus on INT, all the way until you reach 25. Do not bother with other stats. Upon reaching level 25, you can transcend to either a Priest or a Monk. Monks are close combatants who use fists to excel in battle. They also begin with a whole new set of skills, meaning, you will get a reset skill after transcending into a Monk but you cannot add any of the Acolyte’s skill. Monk relies on his lightning fast attacks to stack up spirit spheres for an even greater offensive attacks which require spirit spheres. They have a very strong physical body which means high defense and can serve as Secondary Tanker or even Main Tanker if geared and built properly. Yes, going for a Monk is a tough path to follow as you’ll giving up all of your Acolyte skills, imagine that friendly Heal skill taken away from you. But as you leveled up , you’ll feel the greatness of a Monk. I can guarantee you that. I have listed all of Monk’s skills, description, commentary and personal ratings on each skill below. Description: Struck a target with multiple punches. Inflict 17%/19%/21%/23%/25% of your attack power. Generates 1 Spirit Sphere. Commentary: Your main DPS skill. It has no cooldown and the animation is quite fast. I really recommend you to max this skill ASAP after transcending into a Monk. Description: Passively increase your defense by 10%/20%/30%/40%/50%. Commentary: 50% extra defense at level 5 and it is passive. MAX THIS BABY. Description: Gain 2 attack power for each Intelligence and allows you to generate Spirit Sphere while using offensive skills. Commentary: This could be the best passive you’ll ever had alongside with Iron Palm because simply it is a passive skill! Now, you do not have to worry about investing Intelligence (INT), rather, it enhances your attack power up to the fullest. Because of this skill, an equalized amount of STR and INT is better than a pure STR/INT stats. For example: 30 STR and 30 INT is better than having 40 STR or 40 INT alone. Description: Gather your inner strength to crush 2 nearby enemies by 37%/39%/42%/44%/47% of your attack power. Requires 3 Spirit Spheres. Commentary: Your secondary DPS skill after Quadraple Palm. The skill got greater damage, twice the damage of Quadraple Palm and it hits 2 enemies. The only downside is that this skill requires 3 Spirit Spheres. You will need to build up your Spirit Spheres before using this skill. Description: Strike an enemy with a series of tackles to inflict the damage of your 14%/16%/18%/29%/21% attack power. Generates 2 Spirit Sphere. Commentary: This skill has horribly low damage and it has a pretty long cooldown. Leave this skill at level 1 because you’re only using this skill to obtain two Spirit Spheres instantly. Description: Taunt an enemy to make it attack you. Commentary: Similar to Swordman’s Provoke, you taunt an enemy to attack you instead to your party members. A great tanking tool indeed, also used to hold aggro. Description: Instantly generates 3 Spirit Sphere and reset the cooldown of all your skills. Commentary: Personally, I love this buff. With this you can do two consecutive Guillotine Fists in a row, every two minutes. How awesome is that? This buffs really helps in PvP, also the most important key to guarantee your victory. But, if you don’t PVP that much and do not plan to PVP in the future, you can leave this skill at 1. But really, you’ll regret not having this skill maxed. Description: Creates a shockwave by pounding the ground to inflict 15%/17%/20% of your attack power to maximum 3 enemies and generates 50% threat. Commentary: Your aggro keeping tool. Spam this every 3s while facing multiple mobs to ensure your party’s safety. Use the combination of Intimidation Lightning Crush and Stone Skin permanently keep your aggro especially when tanking a boss. Description: Increases your dodge rate by 4%/8%/12%/16%/20% for 10 seconds. Commentary: I think it would be a waste to invest any points in this skill at all because we are not Thieves. We don’t have that much AGI in the first place. This would’ve been a great skill to have if it adds +20% to our original dodge rate raw. Description: Instantly move in front the targeted enemy and strike it with 17%/19%/21%/23%/25% of your attack power. Generates 1 Spirit Sphere. Commentary: Personally, this skill is great. I found love from this skill. While it is not that important in PVE, I gotta say this skill works wonder in PVP. Fact: There are a lot of runners in PVP and you should use this to chase your enemy. In PVE, this skill main usage is just to generate spirit sphere. Description: Fire a spirit bullet to your enemy from far away to inflict 17%/19%/21%/24%/26% of your attack power and increase 10% of damage inflicted by all of Monk’s offensive skill for 15s. Generates 1 spirit sphere. Commentary: Monk’s greatest debuffing skill. While the damage is not that great, the only and the sole reason of this skill is just to debuff your enemy so that you will deal more damage with other offensive skills for what, 15 seconds? That means you can perma-debuff your enemy! This skill also generates 1 spirit sphere. How great is that? Just leave this skill at level 1. Description: Increases your attack power by 6%/12%/18%/24%/30% for 30 seconds. Requires 3 Spirit Spheres. Commentary: This is also one of the greatest buff you can have as a Monk. It increases your attack power by 30% at level 5. It has 60s cooldown with 30s duration. If you want to get a slight increase on your DPS, you should max this skill, but it’s okay to just leave it at level 1 if you’re a pure tanker. You’ll need this buff in order to use Guillotine Fist. Description: Gather your mind, spirit and physical power to deal a tremendous strike. Inflict 82%/91%/101%/110%/120% of your attack power and stuns your enemy for 3 seconds. Only available in Ki Explosion state. Commentary: Your ultimate offensive skill. Although it has the highest damage modifier in RO2 when coupled by Ki Explosion, its cooldown is still quite long. Still, I recommend you to max this skill because the increase per level is high, not to mention this skill stuns your target for 3s which is great! Description: Gather your spirit to emit a defensive aura that surrounds your body. Decreases any damage taken by 10%/20%/30%/40%/50% for 10 seconds. Commentary: Everything is just great except the duration and cooldown part. It only buff you for 10 seconds with a 120s cooldown. But, every seconds count, especially in raids. Believe me, you will not regret maxing this skill, if and only if you’re planning to be a tanker. Otherwise, you can choose to leave this at level 1 for Steel Body. Description: Gather all of your spirit sphere to increase your HP by 7%/14%/21%/28%/35%, Defense by 40%/80%/120%/160%/200% and Threat Value by 60%/120%/180%/240%/300% but decreases attack power by 10% while this skill is active. Press this skill once again to deactivate the buff. Require all 5 spirit spheres. Does not require spirit sphere while Protection Ki is active. Commentary: Monk’s ultimate defensive skill, which means this skill is the ultimate tanking tool of the Monk’s tree. This skill generates a tremendous amount of threat. Use this with Lightning Crush to always keep aggro. Your HP will be increased by 35% and defense by 200% at level 5. I really really recommend you to max this skill. The Monk has several skill builds, namely: Pure Tank build, DPS-Tank (Hybrid) build, and the pure DPS build. To be noted that you cannot add Acolyte skills anymore once you transcend into Monk. Disclaimer: The purpose of this section is to recommend you the builds that I’ve created. You can choose to follow this build or customize it the way you like. If you want some suggestions you can post it in this thread. This build is very good in raid runs and you’ll almost welcomed in any raid party because you have all tanking tools like Intimidation and Flee. But this build has low DPS capability, and you’re pretty much useful limited for tanking. You will solo just fine with this build, it has all the offensive skills and defensive skills needed. You are also acceptable in raid parties as they also need your DPS. And you can PVP just fine with this build. Leftovers can be spent on either Lightning Walk (for PVP) or Intimidation. The only advantage you have when using this build is you will feel a drastic increase on your DPS. But this build is still not recommended, because the build does not have the versatility which is Monk’s main feature. You will have a hard time joining a party, you’ll lack of defensive skills which is needed in PVP which means you will die faster. The advanced version of hybrid build. You can solo/party leveling just fine with this build. You are also acceptable in raid runs and most importantly, you got all the advantages in PVP when using this build. Lightning Walk is maxed for mobility, Summon Spirit Sphere is also maxed to do the infamous 2 consecutive Guillotine Fists. That’s not all, you can also tank just fine with all maxed defensive skill. This build lacks Flee skill which in my opinion is useless. I’ve listed all types of the stat distribution for a Monk. – Leftover to either VIT/AGI. – Leftover to STR or increase AGI/VIT. In addition to Aquilon (Wizard), I also play as Levante on the Korean server, and the armor you see is (also) lv 50 raid (epic) equipment for the sorcerer. If you’re currently looking at this… please save yourself and play as a female character if you want to play as a sorcerer. The sorcerer is a very BUSY class. Deal, heal, revive, support, buff… you do it all. Even though you do it all, you always compete for the highest deal spot. Critical hits are your friend, and you find yourself often wishing you were just a support or a dealer, but you have to put up with it. If only you had the int buff and hp buff, you would put wizards and priests out of business. Sorcerer is a class that has many skills that are useful, but happen to have not enough points to invest in all of them. Summon Aqua – At first glance, it’s just an attacking skill but this is a skill that helps you in mysterious ways. Although it cannot be killed for the 30 seconds it is spawned, it can lure tornadoes and other random targeting skills. Even at level 1, it does decent damage (it works just like a DOT skill that’s stack able by multiple sorcerers) while acting as a support skill for luring various unwanted attacks. Foresight – This is your PvP skill or a skill you use when you are about to go against a boss. Either way a level 1 Foresight does more than enough. Because it allows 3 spells to be casted without cast time, frost diver – jupitel thunder – varetyr spear will take out about any character. (including tanks) Against bosses, three cold bolts are used in succession for a high chance for the wind arms effect and/or jupital thunder mastery effect. This sorcerer is built for taking out minions and mobbing. When paired with a wizard with frost nova, this sorcerer are untouchable. This sorcerer is rare due to the emphasis of both earth shield and deluge. Frost Diver + Lightning Bolt (+ Varetyr Spear) – This will melt any enemy that can be frozen. There are certain enemies that explode when in contact and the radius of explosion differs, some only damaging those touching while some killing off half of the battlefield. Frost diver stops such explosions, and with lighting bolt (and with the help of varetyr spear) should be able to take down such enemies before they cause any trouble. Additionally, frost diver + lightning bolt with wind arms effect + critical can hit up to 2500 and frost diver + jupitel thunder with wind arms effect + critical can hit up to 10000. Lord of Vermilion – This is paired with with the wizard’s frost nova spell. Although it does only 34% lightning damage, it would be 68% with the wizard’s frost nova spell or the effect of wind arms, and even higher with critical attacks. Many people interchange these two spells, but they never go for both due to the lack of skill points. However most go for deluge as it is more frequently needed in parties, and the responsibility of earth shield is thrown to the next sorcerer in line. This is the most common sorcerer build. It literally does it all: heal, revive, attack, buff. However, the hybrid sorcerer finds itself wanting even one or two more points no matter how they try to change it. This I usually leave for personal choice but to do the recent patches I want to recommend deluge. Although a Hybrid can’t heal close to a priest, it is usually found healing in tough situations and land of recovery is used nonstop. At best, it might be able to heal 2nd tank. No matter how good you might be at healing, I find it no use when a sorcerer is on the ground dead. Being a Hybrid sorcerer myself, I can tell you that your main job is not healing or attacking, or even reviving or buffing people, but staying alive. If you’re going for this build… please don’t argue with priests. Priests do get angry when seeing healing levels that are on par with them, but do hold back. Those who play as priests explained it as “graduating medical school to find someone who barely graduated high school in the same profession.” Please don’t get offended. Priests hunt with level 1 holy light until they hit level 50 while heal sorcerers use level 5 cold bolts and level 3 jupitel thunder. Although heal sorcerers lack a few buffs, it acts a little too well as a healer. Meditation – This is one of the spells that make you think. Priests also have a very similar skill but it is left at 1 because the base healing for priests are so high, it is unneeded. However, sorcerers have fast but low healing which would make meditation much more valuable than those of priests. Rejuvination – Although cast time should be “instant” the actions say otherwise. It has so much unneeded movement that during one use of rejuvenation, healing wave would have done just as much or even more, especially when using wind arms. Those who use Earth Arms say that those who use Wind Arms seem better at healing, and vice versa. I too cannot tell the difference between the two, so personally I would go for Wind Arms because it also helps cold bolt and jupitel thunder, but if Earth Arms which naturally gives DOT healing as well as higher healing from Land of Recovery, feel free to go for that one. There are even people who put no points in Meditation and only four in cold bolt, and ended up mastering both Wind Arms and Earth Arms. Alright so I’ve been doing a bit of research for a friend of mine that I’ve known and played MMOs with for a LONG time. He was planning on making a tank of some sort in OBT, and asked me to look into the different nuances of the tank classes and do a bit of theorycrafting for him (mostly because the large part of the joy I get out of MMOs is just that, making charts, spreadsheets etc to maximize DPS, threat generation, healing efficiency, boss strats, that sort of thing). I’ll start with initial information that can be gathered simply from the RO2 skill simulator. – Initially upon looking at just the skills the “tank” classes get, it’s VERY clear that Beastmaster is meant more for an offtank role or simply as a safety net in case one of your tanks gets dropped so you can buy time to res them. Now since I haven’t played this class at all I’m not sure how stats effect their survivability (someone that’s been playing kRO2 would be awesome to chime in here). – If I’m being honest, Knight looks overall fairly underwhelming as far as tanks go. Their big “oh crap” skill completely immobilizes them, and the only sort of survival skills they get are flat damage reduction, and for the most part in my experience evasion is always better then just reduction. – Monk seems like it has a pretty solid kit overall, has some decent evasion, as well as a 50% DR skill for when things get dicey. Not to mention the passive +50% defense is pretty awesome looking. – At first glance Warrior actually looks like it has the best tanking kit out of all of them. They get a block steroid, a DR buff, then a buff that increases ALL their defensive stats at the cost of a measely 10% attack. Not to mention a rather beefy Heal over time to lessen the strain on your healers. As I’ve said I haven’t gotten a chance to play these classes personally (partly because I almost exclusively play healers), and because I can’t get on kRO2 and got into CBT fairly late. As I said I’m trying to gather more information on these classes for some further theorycrafting, so anyone with experience with these classes being able to chime in on stuff would be amazing.